It was decided to open a solo exhibition at the hill. I thought that it would be fine if only one guest visited. However, the number of people there has gathered. Moreover, only girls like art college students. Objects of stone line up in the hall. Exhibited my work on them like most exhibition stands. There were also works between objects and objects. They are casually placed like luggage. They are not my work. Apparently it seems that the guests brought the guests. I take one of them and look at it. Cut and paste paintings are given on the mesh side. A girl from the author who will be a fan will ask. that changes with viewing angle is wonderful!" It feels like being in Comiket venue. By the way, I finally noticed. A stone object is invisible as a tombstone. Is not it like a cemetery here? 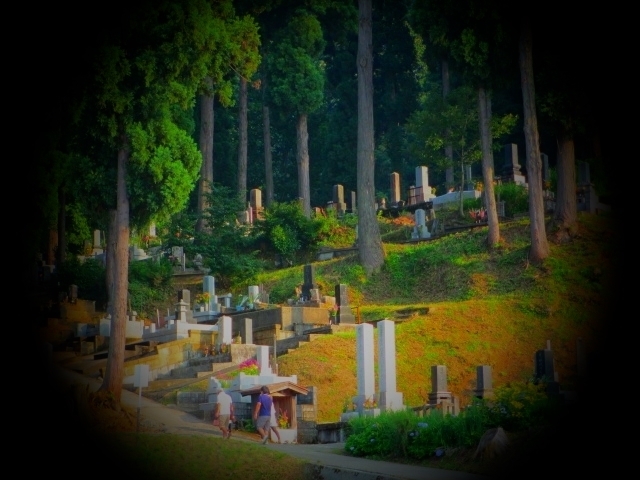 to visit the graves in the country in the evening.